The latest ‘red list’ of endangered bird species released by the International Union for Conservation of Nature ( IUCN ) includes 15 Indian bird species, three of which are found mainly in Gujarat. These include the Great Indian Bustard, the Indian Vulture and Siberian Cranes. All three are in the ‘critically endangered’ ( CR ) category. Several migratory birds that come to Thol and Nalsarovar ( Gujarat ) have also been listed in the ‘vulnerable’ and ‘nearly threatened’ bird species. Officials said the IUCN red list is the list on the basis of which several countries and states form their strategies for conversation of birds. Officials said that the ‘International Union for Conversation of Nature Red List of Birds – 2013’ shows that 15 birds species in India continue to be in the ‘critically endangered’ category. Of these, three bird species are now in greater danger than before. The decline in the population of these species is because of the growing human interference in areas where bird nesting and colonies exist, said the officials. Studies by the Bombay Natural History Society ( BNHS ) and other organizations, including Wildlife Institute of India, of factors most responsible for the failing numbers of several bird species reveal that like wetlands, most other habitats such as grasslands and forests, also face severe threat due to development pressures. The drastic loss of grassland habitat over the past decades has severely threatened species such as the Great Indian Bustard, Siberian Crane, Bengal Florican and Jerdon’s courser. While the extensive use of diclofenac by farmers for treatment of their cattle, had led to the fall in the number of Indian Vultures, the destruction of deciduous forest had lead to the decline in the numbers of Forest owlets. The presence of chemicals in the carcass of animals on which scavenging birds feed has affected their population adversely. BNHS – India Director, Dr. Asad Rahmani, said that on the basis of insightful scientific field research, there is an urgent need to conserve the remaining habitats and the species dependent on them. “Policies that ensure this through sustainable development should be framed and implemented at the earliest,” Rahmani said. Critically endangered species: This category in India includes migratory birds. Grassland Species: Bengal Florican, Great Indian Bustard, Jerdon’s courser and Sociable lapwing. Ministry of Environment and Forests (MoEF) had directed Gujarat, Madhya Pradesh and Rajasthan to have state – level recovery plans for the great Indian Bustard. Gujarat principal chief conservator of Forests C.N. Pandey said, “We had met experts recently and have now prepared a draft report, which has been approved and is in the final stages”. 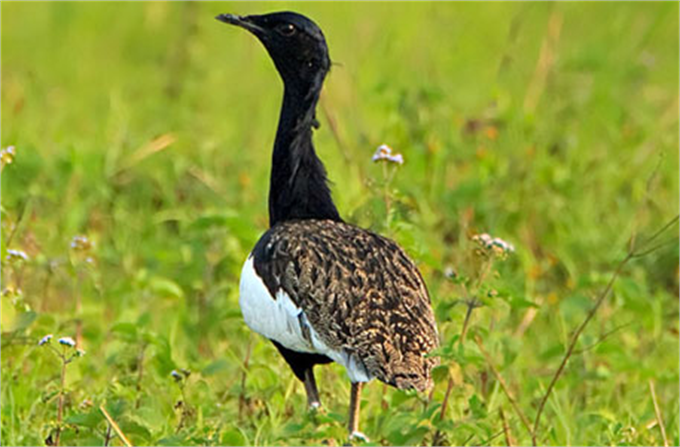 The MoEF had directed all bustard range stages to prepare state – level recovery plans to conserve the species. The proposed plan will aim at long – term conservation of both bustard species in Kutch in Gujarat. With this state-level initiative, it is expected that the conservation of and habitat restoration of Great Indian Bustard (GIB) will get a boost. Officials in the Bombay Natural History Society (BNHS) said many vital and bio-diverse habitats such as grasslands and species inhabiting the Great Indian Bustard continue to remain neglected. Officials said grasslands have been threatened for long from rising human pressures on the habitat, indiscriminate grazing outside traditional grounds, poaching, urbanization and several other factors. Several flagship grassland species of birds and animals including GIB, Lesser florican, chinkara, fox and wolf have been affected in various parts of their former range including Kutch (Gujarat, India). According, to BNHS, the Great Indian Bustard are found in six states in India currently and have populations of GIB and Lesser Florican in Madhya Pradesh, Maharashtra, Karnataka, Gujarat, Rajasthan and Andhra Pradesh. In case of Madhya Pradesh, at present there are two sanctuaries for GIB and two for Lesser florican. In Maharashtra, the few remaining GIB are to be found at some locations in districts such as Solapur and Chandrapur. The situation in other Bustard range including Gujarat is also a cause of concern. It is worth recalling that experts involved in the conservation of GIB had meet chief minister Narendra Modi and urged him to act and take measures to conserve the bird. According to experts GIB is facing threat through the reduction in the extent of undisturbed arid and grassland habitat, degradation and disturbance to existing habitat, hunting, lack of protection for many traditional “lekking” and nesting sites, lack natural grassland conservation in management and policy. Apart, from these issues there is lack of cooperation between departments and stakeholders in GIB habitats. Livestock overgrazing and disturbance by tourists and photographers, especially during the breeding season, have led to the reduction in the bird’s number. A census of the Great Indian Bustard will be held this month and officials of the state forest department are getting ready for this important exercise. 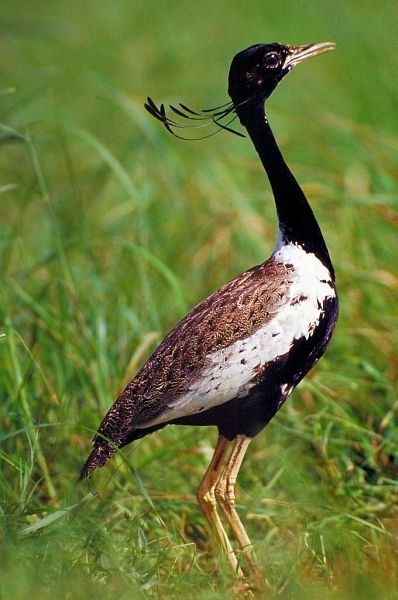 According to forest officials, the 2007 census had shown that there were 48 of these Bustards in Gujarat but data collected by other nature societies had reveled their population to be less than 30. Hence, all eyes are now on this census which is taking place after six years. The officials said that the ‘direct sighting method’ will be adopted for the census in the Kutch Region ( Gujarat, India ) where the bustard is found. This largest flying bird in the world is spotted mainly in Rajasthan, Gujarat, Maharashtra, Andhra Pradesh, Karnataka and Madhya Pradesh. Some birds are also found in Pakistan, mainly in summer. Officials said that a meeting of villagers and forest officials will be held to finalize the programme for the census. Separate teams will be set up and posted in pockets where sightseeing has been reported. The census will be conducted in two phases – the first will be the primary round and the second will be the main final round. Officials said that according to the union ministry of forests and environment, the bird faces several threats to its existence, including threats from the rapid development of infrastructure taking place in Kutch (Gujarat). Domestic and stray animals are also among the major threats affecting conversation efforts for the bird. Apart from these, collision with high tension electric wires, fast moving vehicles and other man-made structures continue to be a threat in the Industrial development zones near bustard inhabited areas. Deaths of Great Indian Bustard have been reported frequently from Kutch in Gujarat and Solapur in Maharashtra. For the bird’s conversation, the Union ministry had asked the state government to undertake scientific studies of seasonal movements of bustards and their lifecycles, regular patrolling of bustard territories and setting up of local networks to monitor the fencing around core bustard areas. Removal of dogs and other nest predators with the help of the veterinary department has also been suggested. It was in 2005 that Dr. Bharat Pathak, currently director of Gujarat Ecological Education and Research ( GEER ) Foundation had rushed to Velavadar Blackbuck National Park in Bhavnagar ( Gujarat, India ). He had heard of a bustard sighting there. Courtesy: – Times of India. Top 25 Photographs from the Wilderness #7. They may disappear even before we get to know them. Four Indian species feature in a list of the ‘100 most threatened’ species in the world. The list consists of critically endangered animals, plants and fungi that don’t serve any obvious purpose for humans and are, therefore, not priority for government conservation efforts. Titled, “Priceless or Worthless,” the list was compiled by the International Union for Conservation of Nature (IUCN) and the Zoological Society of London and released on Tuesday. The ‘Great Indian Bustard’, one of the heaviest flying birds, ‘Gooty tarantula’, a poisonous spider known for its vibrant blue color, ‘Batagur buska’, an endangered turtle and the ‘White Bellied Heron’ are all on the brink of extinction, according to the list, released at the IUCN World Conservation Congress in South Korea. ‘Priceless or Worthless,’ highlights the plight of species that have been endangered but haven’t received adequate attention from governments. Conservationists fear the neglect will continue as none of them provide humans with obvious ‘benefits’. For the first time, more than 8,000 scientists from the IUCN Species Survival Commission (IUCN SSC) came together to prepare such a list. The four species lack the charisma of bigger endangered animals like tigers. But the disappearance of the four species is of concern as all four they once occurred in great abundance in India. The Gooty Tarantula (also metallic tarantula or peacock tarantula), was plentiful in Ooty, Tamil Nadu. According to the list, there are just 50 to 249 adult birds left of the Great Indian Bustard that was very common in Maharashtra, Gujarat, Rajasthan and Karnataka. There is some hope for the Great India Bustard, which is believed to be on the verge of extinction. The bird population, which was around 48, is likely to cross 50 mark and record an increase of around 15-20%. 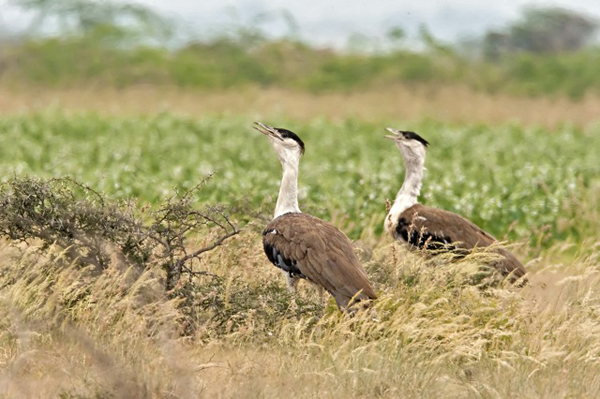 In 1998, only 29 bustards were found in Gujarat and after that there was no sighting. 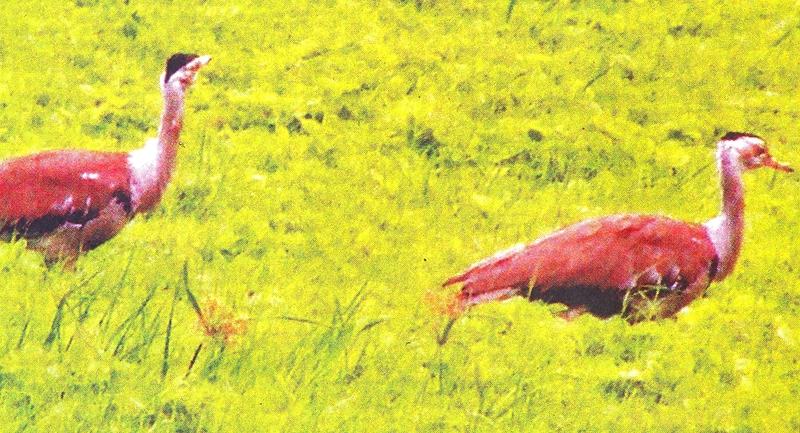 Finally, nearly after eight years, the bird was again sighted in 2005-06 in Abdasa. It was then that a study was taken up by the Gujarat Ecological Education Research, and the findings were heartening. The bird population was spread across Abdasa Taluka. The study reveals that a total of 35 Indian Bustards were counted in the winter population survey. The umber in the post-monsoon period hit 48, of which 21 were females. Forest officials said an internal survey by department afforded some encouragement. The official’s said that they spotted chicks, which was a sign of healthy breeding in the area. The majestic bird is locally known as Ghorad. The population is likely to be around 55. Officials said that the sanctuary is just 202 hectares in size, which was not enough. They said hat during the internal survey, more birds were spotted outside in open areas rather than in the sanctuary. The shy bird, resembling the ostrich, is a good flier but prefers to walk in open spaces. The bird even roosts and breeds tin the open. The official’s census will be conducted in Abdasa and Naila Taluka where the birds have been spotted. “The census will be taken up in the last week of September or first week of October,” said the conservator of Forest D.K. Sharma.